Mum has taken to selling her homemade produce to farm shops. So far it has turned out to be a modestly profitable enterprise. 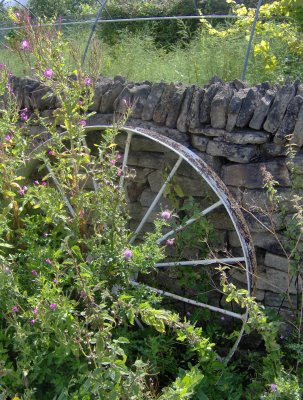 On one of her latest sales runs to the ramshackle Mickleton Nurseries Farm Shop, near the village of Mickleton, Glos, I took my camera along and found an old wheel I liked the look of. Clicking on the picture will enlarge it.